Davening for a sick person on Shabbos? May one daven for a sick person on Shabbos? Not a simple matter. Recall that we don’t say the regular, weekday Shmoneh Esrei, which contains a prayer to heal our sick, on that day. What about making a מי שברך לחולים for an ill person on Shabbos? Were your answers to the above two questions the same? Different? If so, why? A recent issue of a קובץ תורני (Torah journal) by the name of קובץ חצי גבורים, פליטת סופרים, from this past אלול, includes a major contribution by רבש”ה, Rav Binyomin Shlomo Hamburger, נ”י, bearing the title of מי שברך לחולים בשבת, in which these and some related topics are masterfully and comprehensively expounded upon and explicated. In many Shuls today, the mi shebeirach lecholim on Shabbos is a drawn out affair. Some people seem to rack their brains to think of any person, with almost any kind of health issue, they could include in it (not surprising – after all, we are רחמנים בני רחמנים :). In some places, long lists are read by the mi shebeirach maker, while in others a new custom has been innovated, in which people in the congregation say names they wish to have included, while remaining in their places. Many people do not seem to be aware that it is not a simple matter to assume that davening for a sick person is allowed on Shabbos. While there were and are decisors who ruled that such davening is allowed, a significant body of חכמי אשכנז held that such is allowed only for a חולה שיש בו סכנה, someone who’s life is in danger, specifically בו ביום, on that very day of Shabbos. Rav Hamburger takes his readers on a journey through many centuries, exploring how our chachomim addressed this issue, navigating skillfully through the waters of Talmud, and pages of Midrash, Responsa, and Siddurim. The wide ranging exposition ranges far and wide through many centuries, including examinations of various nuschaos (versions) of mi shebeirach texts, as well as the emendation made by R. Avraham Gombiner, the Magen Avrohom, to the מי שברך לחולה text, the reaction to it, and instructions (or their lack) in סידורים (prayer books). Also discussed are the meanings of enigmatic Talmudic phrases that figure in the discussion, such as שבת היא מלזעוק ורפואה קרובה לבא, and יכולה היא שתרחם. At the end he notes that while widely accepted poskim such as Chayei Adam, Aruch Hashulchan, Mishna Berurah, Shulchan Aruch Harav, among others, said that it should be restricted to a חולה מסוכן on Shabbos, much of Eastern European Jewry (with some notable exceptions) seem to be meikil on it, conducting unrestricted mi shebeirachs for cholim. On the other hand, the older minhog was maintained among Bnei Ashkenaz (‘Yekkes’), among whom, not only was such restricted to a choleh sheyeish bo sakonoh, but also the mi shebeirach used was a regular mi shebeirach לבריא, rather than the mi shebeirach lecholeh. The gedolim and poskim that limited mi shebeirach for the ill on Shabbos, did so, not, חס ושלום, G-d forbid, out of a lack of compassion or cold heartedness, but rather, following the mesorah they received, out of concern that the special atmosphere of Shabbos, its sanctity and tranquility, not be compromised by such supplications (except for extreme cases, and even then just in a limited manner). The Shabbos itself, with its atmosphere of holiness and tranquility, is therapeutic and healing. As alluded to in the text of the מי שברך לחולה, there is a connection between רפואת הנפש, healing of the spirit, spiritual health, and רפואת הגוף, healing of the body, physical health. That special Shabbos atmosphere needs to be guarded to be properly maintained. Additionally, the zechus, the merit of keeping Shabbos properly, which, as we say in the shmoneh esrei of mincha on Shabbos, is מנוחת אהבה ונדבה, מנוחת אמת ואמונה, מנוחת שלום ושלוה והשקט ובטחת, is itself a great zechus, which accrues to the benefit of the חולה and others who guard it. Once again, Rav Hamburger has illuminated for us, with great light, the ins and outs, as well as the roots, branches and variations of a Jewish practice forgotten and misunderstood by many. In addition to the great contribution and sheer enjoyment that this enthralling contribution to לימוד התורה represents, it is also very welcome for another reason. Namely that it is the first such new lengthy, Shorshei Minhag Ashkenaz type exposition (it is written in a format like that used in Shorshei Minhag Ashkenaz, e.g. starting from the beginning, from relevant early sources, such as Biblical and Talmudic, tracing the practice down through many generations in later sources such as halachic codes, collections of minhogim, and siddurim, followed by surveys of practice in different lands of Jewish settlement, culminating in a final review/summation section) to appear in some time. Since the four initial volumes of Shorshei Minhag Ashkenaz (SMA) (as well as the accompanying small introductory volume, גדולי הדורות על משמר מנהג אשכנז), appeared between app. twenty and ten years ago, no new volumes have appeared in recent years (though a fine volume with an English synopsis of the Hebrew volumes appeared a few years ago – and now is listed at hundreds of dollars at Amazon.com – wow! ), while Rav Hamburger was occupied with other literary endeavors, such as הישיבה הרמה בפיורטה, ירושתנו, וכו. It is hoped that this new perek (which Rav Hamburger indicated may be incorporated in a future volume of SMA) heralds the return and resumption of the highly acclaimed and very necessary series in the near future. According to the Machon Moreshes Ashkenaz website, a number of new works are awaiting sponsorship, including SMA V & VI. Hopefully הקב”ה will send discerning sponsors soon that appreciate the greatness of this work (along with other valuable MMA products), to partner with the Machon and enable the resumption of its dissemination. It is a series that has gained wide acclaim, in wide circles of cognoscenti. From Talmidei Chachomim, to Academics, to Bnei Ashkenaz, to regular Jews, who recognize something special when they see it. This entry was posted on December 24, 2014 at 2:11 am and is filed under Ashkenaz Davening, Ashkenaz History, Minhag confusion, Minhog Ashkenaz, Minhogim. You can follow any responses to this entry through the RSS 2.0 feed. You can leave a response, or trackback from your own site. How can I buy this booklet to read the article ? It is available at some (not all) better stocked seforim stores. Ask around, sooner or later you should be able to find it. Or you might be able to recognize the cover from the photo. By the way, the kovetz is a more than a booklet. It is hardbound volume of more than seven hundred pages (amudim). 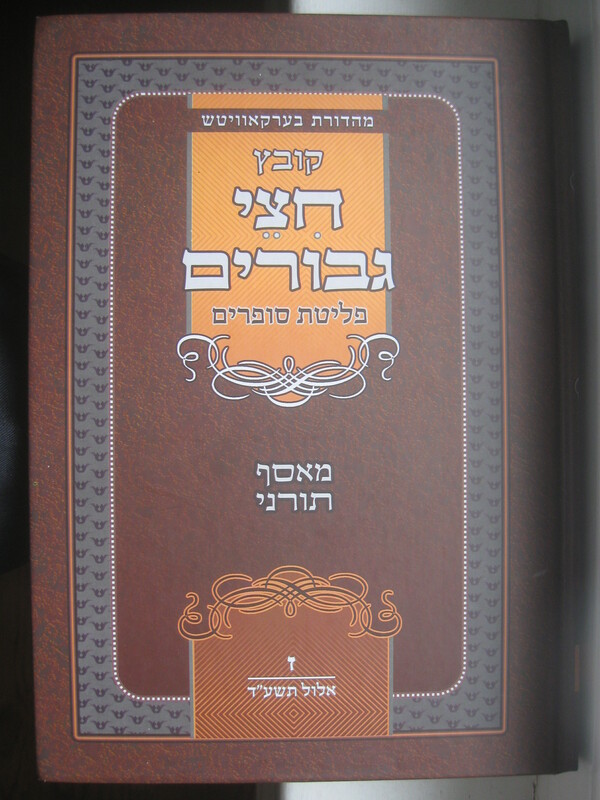 Rav Hamburger’s contribution runs a bit over sixty pages (amudim). Some outlets online seem to have it as well, such as this site, and this one.